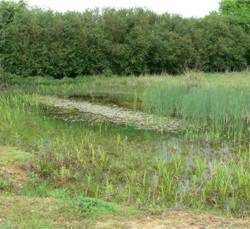 Do you have great crested newts (GCN) on your land? Penny Anderson Associates Ltd. (PAA) can help you with our bespoke service, tailored to your needs from early in the pre-planning stage. We can take you through the preliminary desk study phase to identify a potential risk, we then assess that risk through surveys, and then mitigate the risk through licensing and mitigation should this be required. All works are undertaken by vastly experienced teams familiar with current legislation and best practice in mainland Britain, and who are fully licensed to undertake GCN work. 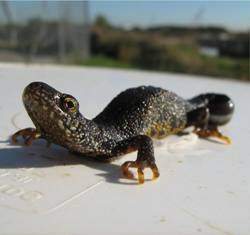 In Britain there are three species of newt of which the Great crested newt is the largest and the only one having special legal protection. GCN are widespread in mainland Britain, but extremely localised, and have declined rapidly in number over recent years. New development and construction is often blamed for this; in many cases this is a result of their local distribution not being fully understood prior to development, or due to some other contributing factor such as pollution, neglect, and inappropriate landscape management. National Planning Policy Framework. This means that all Local Planning Authorities must give due consideration to their needs when determining planning applications. Where GCN must be taken into account on development sites we regularly apply for Development Licences and can offer an efficient and pragmatic approach to your specific situation. Provision of training for GCN workers.